As a senior citizen, it is very important to make sure you are getting daily exercise, especially if you want to continue living a full and independent life. One of the many issues that a lot of seniors face is that they no longer have the ability or the health to do what they love. This may be because they did not pay attention to their health or they did not get regular exercise. Their diet may not be good, too. If you want to prevent this fate, it is important to start exercising as soon as possible. The important thing is to get up and move. Living a life on the couch can lead to many serious and even life-threatening health conditions, not to mention this can cause depression, lack of motivation and energy. It can sap your will to seize the day. As a Home Care in Florida, Hand in Hand Home Care Solutions is committed to helping enhance your quality of life and this includes providing you with the personalized exercise support you need. Kinds of Exercises: As a senior citizen, you may not have the ability go and run a marathon right away, you will need to start small and build yourself up. In order to improve your physical strength, you will want to start with something easy like walking. Walk for fifteen minutes a day and when that feels easy, increase it to 30, and when that gets easy, try jogging. Gradually increase your workout level for more effective and safer results. 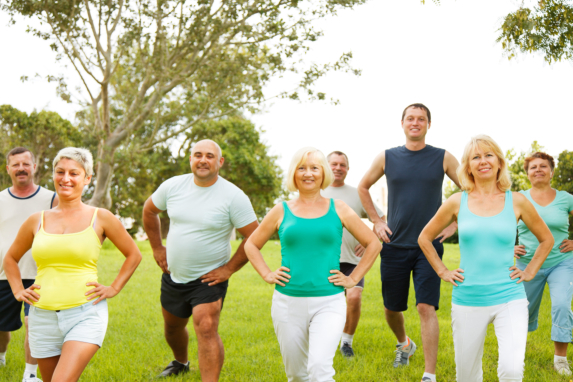 The Benefits: Exercising has many different kinds of benefits that you will surely love. Through exercise, you can improve your physical strength and improve the amount of energy you have. This will help you feel younger! Exercising is also known to make you happier due to the endorphins being released in your system while doing physical activities. Without a doubt, one of the best ways to maintain your youth, your health, and your independence is through regular exercise. This will make sure that you have the ability to go out and seize each and every day, whenever you want. We will also help you every step of the way through our Home Care Services, which you can learn more about at our website www.handinhandfl.com today. This entry was posted in Home Care, Senior Care and tagged a home care in Florida, Elderly Care companions, Exercising, homemaking. Bookmark the permalink.